I’m moving into a new house at the end of May. I’m ridiculously excited about the new house; we’ve been in a rental since last summer, so I can’t wait to own a house and be able to make it our own. And while it’s hard to wait for several more weeks to move, the timing – moving at the start of the summer break – should work out perfectly to have lots of time to finally get busy on all my Pinterest projects! I’m taking advantage of the time I have before the move to do some sorting and cleaning out; I want to have less stuff at the time of the move than I do now. Last week I listened to the audio version of Marie Kondo’s book The Life-Changing Magic of Tidying Up. She says that the first part of getting organized is to get rid of everything you don’t need or want – anything that doesn’t bring you joy when you touch it. It was easier than I expected to sort out my clothes and other random things around the house; I took six garbage bags and three boxes full of stuff to Goodwill over the week. Such a relief! There’s one area, however, that I’m finding much more challenging to give anything up: my teaching supplies. I’ve taught four grades at multiple schools and through countless curriculum changes. 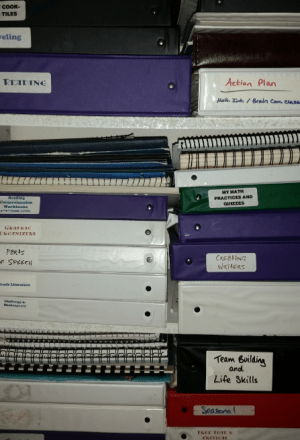 For each unit I’ve taught I put together a three-ring binder with all of the materials I collected over the years – things I’d found, things that I’d made, unit calendars, study guides, tests. Everything. And then there are the boxes. So many boxes. As teachers we know that just about anything can be a learning material. I’ve been collecting things to use with students for more than 20 years. I have little things, like boxes of seashells (at one point carefully placed in plastic bags and individually labeled, though the glue on the labels has long since given out. And I have big things, like a four-foot tall wooden frame, like a huge capital “I,” that I used as “stocks” when I taught colonial US History to 5th graders. They would sign up and wait in line for their chance to stand at the front of the class with their chins and wrists resting on the top of the “I.” Weirdos. I have a box of black felt circles with holes in the middle, which I used for both pilgrim collars and hats, though they ended up really misshapen after the first time I washed them. And one of my favorites: a king-size white sheet with a diagram of the circulatory system big enough for students to walk on, so they could actually follow the pattern of blood cells from the heart to the lungs and back again. Drawn in permanent marker over the better part of a summer. I was so proud of that thing. Still am. I’ve been out of the classroom the last few years, working primarily in professional development, and slowly I’ve given away parts of my stash. My daughter’s kindergarten teacher – who was in her first year of teaching – got my box of bulletin board boarders. 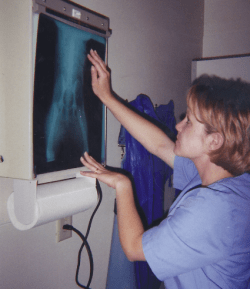 At my vet internship, 16(!) years ago, trying to look like I knew what I was doing. And my books. I’ve “lent out” dozens and dozens of books over the years. I have no idea where any of those are now. Every now and then I go in to find a certain one and discover it missing. Which just gives me an excuse to buy another copy, not unlike when my books would disappear into students’ hands. So I’m having some trouble deciding what to let go of before the move. It doesn’t seem like I need much, but I want to teach again, and who knows what I’ll need. I can probably part with the pilgrim hats. And maybe with a few posters. But I’m keeping the stocks. Who knows when I might need those again! Note: For the Teachers is a participant in the Amazon Services LLC Associates Program, an affiliate advertising program designed to provide a means for sites to earn advertising fees by advertising and linking to amazon.com.